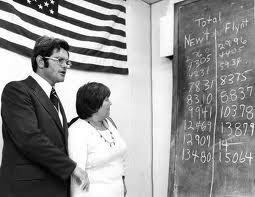 Newt Gingrich has cause for optimism about Florida after winning South Carolina. Polling in the states looks pretty similar -- Gingrich had huge leads in late November and early December, but Romney stepped ahead after the big ad blitz that sunk Gingrich in Iowa. (I don't know if the Romney SuperPACs' anti-Gingrich ads were ever on the air in either of those states -- as far as I know it was just the spillover of media effects from Iowa that brought Gingrich's numbers back down.) So Gingrich's ability to come back in SC seems bodes well for his ability to come back in Florida. He had the debates as a source of good free media in SC, and he'll have that victory as a source of good free media in Florida to push him forward.